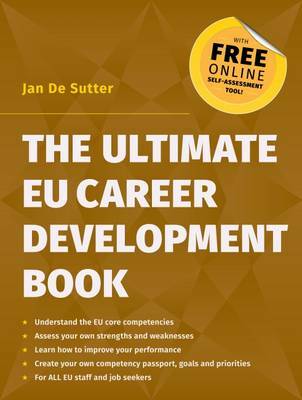 This book is for all EU staff, at all levels, permanent, temporary or contract - and indeed anyone with ambitions to work in the European administration. It shows how to evaluate and improve your personal performance in the EU "core competencies" - for greater job satisfaction, positive performance reviews and career success.Coach, trainer and former EU official Jan De Sutter draws on the best ideas and practice in current management thinking and applies them to the specific context of EU institutions, explaining how the various competencies fit into the EU system for staff selection, appraisal and promotion. The book includes self-assessment worksheets to allow you to discover your strengths and weaknesses and create a personal action plan. In addition, a specially created FREE ONLINE TOOLKIT accompanying the book allows you to do your self-assessment easily online, automatically generating a personalised competency passport and priorities for action. You can even, if you wish, get anonymised 360-degree feedback from family, friends and colleagues so you can compare your self-assessment with other people's evaluation of you!Using the book and free online toolkit in conjunction, you have a complete package for understanding the competencies, evaluating your own performance and planning your personal development needs. With this book you will be able to:* Understand the EU core competencies of analysis and problem solving, communicating, delivering quality and results, learning and development, prioritising and organising, resilience, working with others, and leadership. * Assess your own strengths and weaknesses in each competency. * Learn how to improve your performance in each competency. * Create your own competency passport, goals and priorities.Individual chapters explain what each competency is about, and its related "behavioural anchors", moving on to insights and practical tips for self-improvement. The book is designed to be as accessible and as easy-to-read as possible, practical and informal, with plenty of useful checklists and learning aids - and cartoons by Ted Goff add moments of humour. Jan De Sutter is a coach and trainer working with EU staff and EPSO selection competition candidates. A former EU official who has served on EPSO selection boards, Jan has decades of front-line experience in management roles in both the public and private sector. To write this book he has applied current best practice to the real world of the EU administration, with extra input from occupational psychologists and serving EU officials.